Ten million Princes command the Empire’s reach of the universe, ruling colonial human settlements across time and space. Prince Khemri has just come from his conditioning to become a Prince, something he’s always dreamed of. But being a Prince is not what he expected it to be, and the Imperial Mind far less admirable than he was ever told…what will become of him when nine million, nine-hundredthousand nine-hundred and ninety-nine other Princes all want him dead? In the 17 years since Garth Nix’s first novel, Sabriel, was published, he has become somewhat of a household name when it comes to young adult fantasy writings. With good reason- The Old Kingdom series was critically acclaimed, and though his more recent series have been less focussed on young adults and more on older children, Nix is still recognised as one of the leaders of fantasy worldbuilding in the genre. This, coupled with my not-so-guilty pleasure for YA sci-fi (something of which there is a distinct lack of right now), had me in no doubt that this novel would be a superb book, and more importantly, a book that I really wanted to read. I wasn’t disappointed. It could be said that Nix takes his space-operatic inspirations from Star Wars, but then it isn’t like Star Wars at all. Nor is it like the space-faring adventures of Jim in Disney’s Treasure Planet, or the intergalactic diplomacy (or not) of Star Trek or countless other science-fiction brands. Yet, A Confusion of Princes feels like all of these and none of them- as if Nix looked at them all and said, ‘I can do better than that’ and did. His world of the Empire, and of Princes, of Bitek (bio-technology), Mektek (Engineering) and Psitek (Kinetic communication), of far flung systems, of wormholes and Empirical Navy and colonialism is so rich and diverse in culture and atmosphere that, given time, I believe Nix could create something far superior. Naturally, that’s what you would expect; world-building (or in this case, universe-building) is Nix’s forte: not one of his novels can be criticised for not developing setting enough or creating a rich and original back drop. So what of the characters? Are they any good? Is Prince Khemri, the protagonist of the novel, a worthy hero of such great ideas? Yes. A thousand times yes: he is, undoubtedly, one of Nix’s best characters (though admittedly, I have not read the Old Kingdom Series)- and A Confusion of Princes is, more than anything his voyage of self-discovery and identity in a world where much of what you do is predetermined for you. Nix takes Khemri on a journey of development, showing us the young, arrogant and capable man he once was, and what made him change. 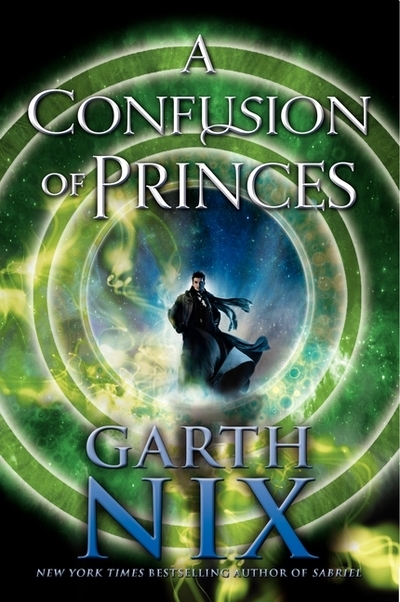 Garth Nix has only made one mistake whilst writing A Confusion of Princes: he has made it a standalone novel that is so good that it deserves to be something greater. The entire world-building seems almost wasted on such a small novel, and with concept such as Nix has, the universe is quite literally his oyster. I can only hope that he changes his mind and pens more adventures of Prince Khemri! There was never any doubt that Nix’s latest YA offering since the Old Kingdom Series concluded would be anything but great, but A Confusion of Princes takes it to a whole new level. Nix has created a fascinating universe system, populated it with intriguing characters and set the adventure level to warp factor 10. The result? Excellent entertainment. I can only hope that A Confusion of Princes becomes a trend-setter.